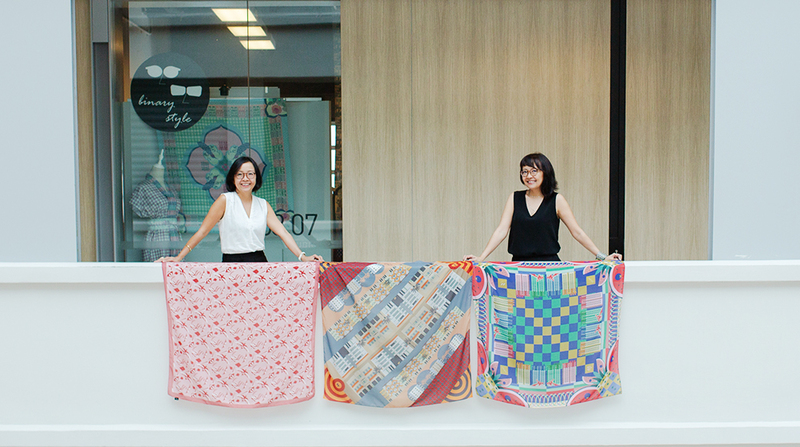 Santhi and Sari Tunas left their careers in architecture to start their own brand of scarves, that showcase detailed patterns of life, culture and history in Singapore. Binary Style has worked with other homegrown brands, as well as large names like Singapore Airlines and the National Heritage Board’s Museum Label. Draped, wrapped, or knotted around the wearer’s neck, Binary Style’s scarves give an outfit some flair with their kaleidoscopic bright colours. But when fully unravelled, their patterns reveal vivid pictures of Singapore’s landmarks, nature, and architecture. These prints, that capture the culture and history in different parts of the island, are designed by twin sisters (as the brand’s name hints) Santhi and Sari Tunas, who make art that reflects their dwellings. Although they were born in Indonesia, the sisters have lived as Permanent Residents (PRs) in Singapore for years and call it their home, where “multiculturalism and beautiful greenery [are like] bottomless sources of inspiration” to them. Since 2015, they have been sharing visual stories of the local life here through the scarves they design. At that time when they decided to create their own brand four years ago, Santhi and Sari became first-time business-owners who were totally new to entrepreneurship, coming out of the careers they established in the architecture industry. “But we had come to a point in our lives when we finally thought, if we don’t do it now, we will never do it,” Santhi says. Santhi and Sari are now in their early 40s, but their interest in art goes all the way back to when they were children, using their bedroom walls as their first canvas, to the chagrin of their landlords. In typical twin fashion, they shared many things in common, and an artistic inclination was just one of them. As they were growing up, they pursued the same field of study, completing their Bachelor’s degrees in architecture in Indonesia, and subsequently taking further studies together in Belgium. They were only apart for long when Santhi moved to Singapore in 2002, while Sari stayed in Europe to get her PhD in Urbanism in The Netherlands, and continued for a stint in academia. She only rejoined her sister in Singapore in 2013. With their expertise, Santhi has been involved in several residential and hospitality architecture projects in Singapore and Bali, while Sari worked with the National University of Singapore (NUS) as a researcher for sustainable cities. While the sisters shared in a separate interview that they’d talked about “doing something together to pursue [their] shared passion of graphic art”, the push truly came when Sari was in between jobs. She spent much of her time going on walks and runs, and the rest of it creating digital art inspired by whatever she saw on her treks all around Singapore. Considering what to do with the artwork, they came to the conclusion of making something wearable, and decided that scarves—which they both love to wear—were the perfect medium to showcase intricate patterns. 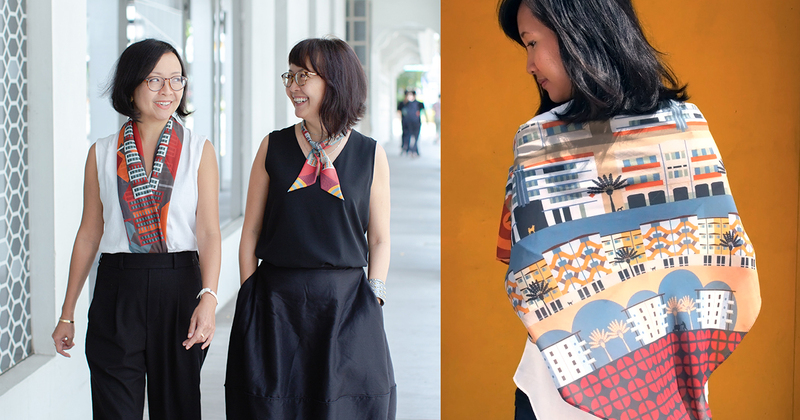 “When we first started Binary Style, a lot of people said that Singaporeans don’t wear scarves,” Santhi shared. Through that hurdle, they learnt that “the key is to educate your customers”, after receiving plenty of surprised reactions when they showed people how many ways they could style a scarf. They took just four months to turn Binary Style from a hobby into a business, and by launching in the year of the SG50 celebration, gained positive responses right from the start. At the time there was, and still is now, a heightened interest for things [that celebrate] Singapore. 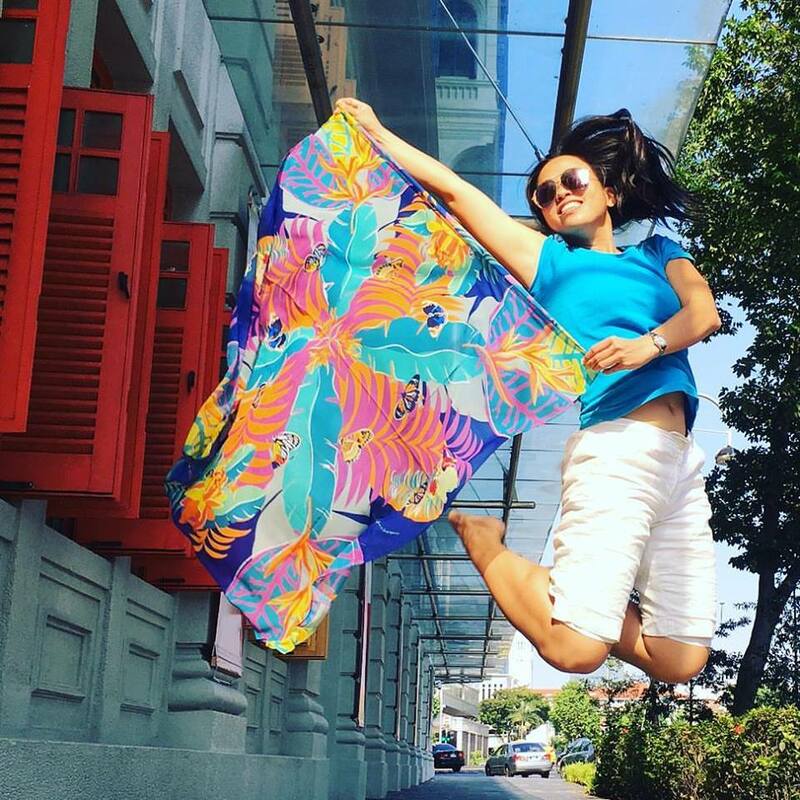 With designs that depict tropical flora at Botanic Gardens, landscapes at MacRitchie Reservoir, colours of Little India, Peranakan tiles, old school games like chapteh, Cantonese opera masks, and dragon boats racing at Kallang River, the sisters believe Singaporeans relate to the stories they narrate on their textiles. 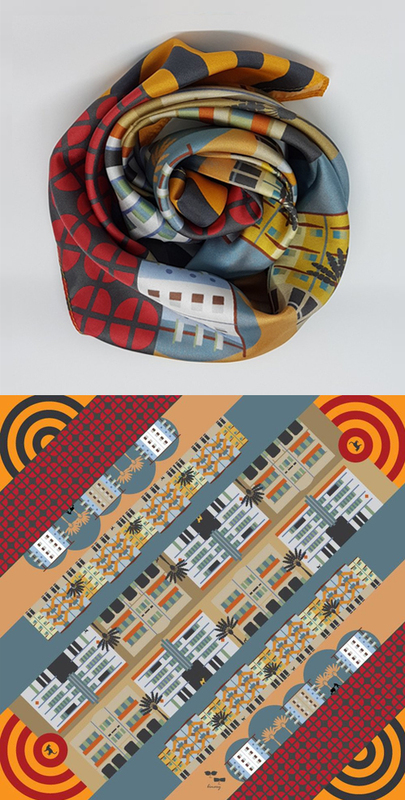 One of their scarves that represents the Tiong Bahru estate quickly emerged a bestseller. Without any business background, Santhi says picking up from scratch was “a great learning curve”, where lessons came in the form of mistakes. But the sisters are grateful to have met some seasoned entrepreneurs in the local scene, like Carolyn Kan, who founded the jewellery brand Carrie.K and lifestyle retail store Keepers. Besides Carolyn who took the new founders “under her wing”, their brand also received support from Singaporean fashion personality, Daniel Boey. 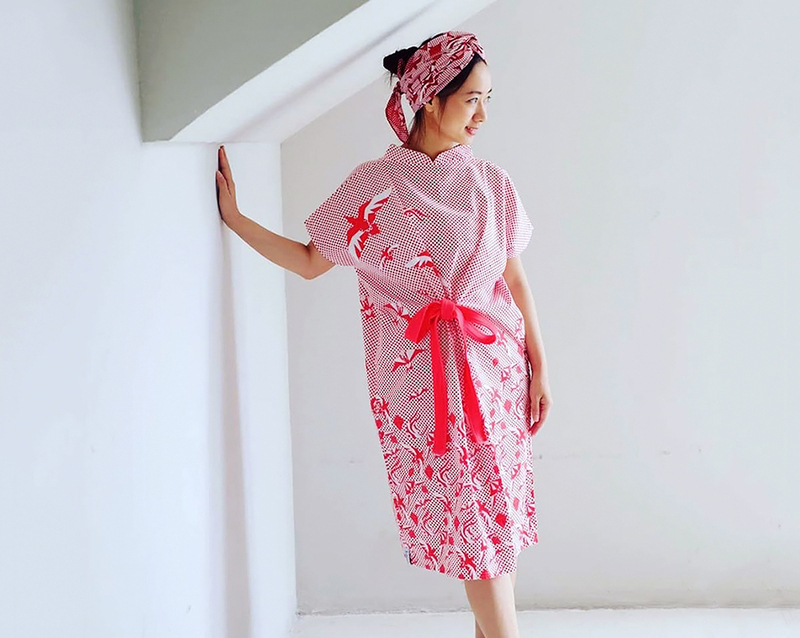 The spirit of local creators supporting other local creators in Singapore benefits emerging brands like Binary Style, giving them new opportunities with stockists and collaborators. 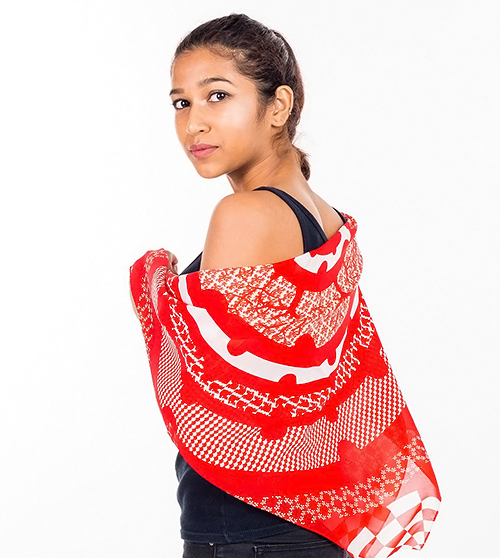 They started having their scarves stocked at homegrown retailers like Naiise and Keepers at the National Design Centre, but didn’t stop with one product. 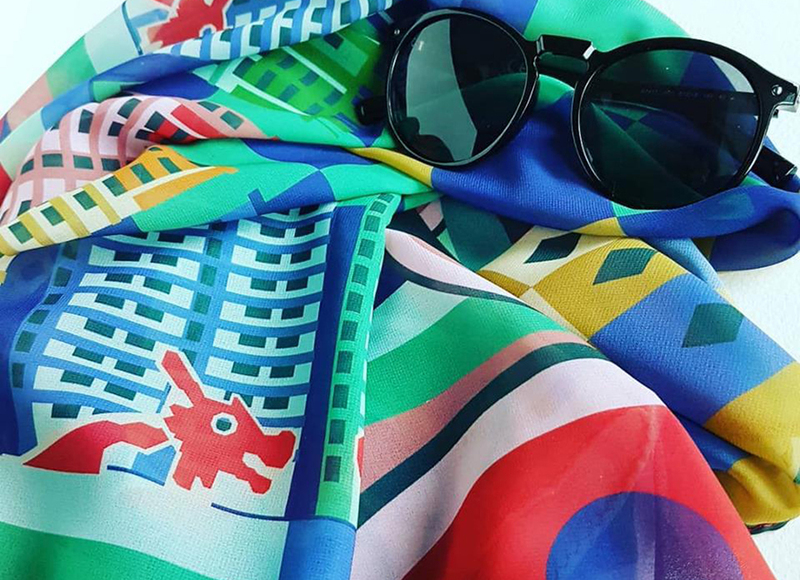 They also expanded to create new products in collaborations with other local brands, reaching new customers as they branch beyond just scarves. With fashion label Ans.Ein, they designed dresses to complete matching sets with their scarves. 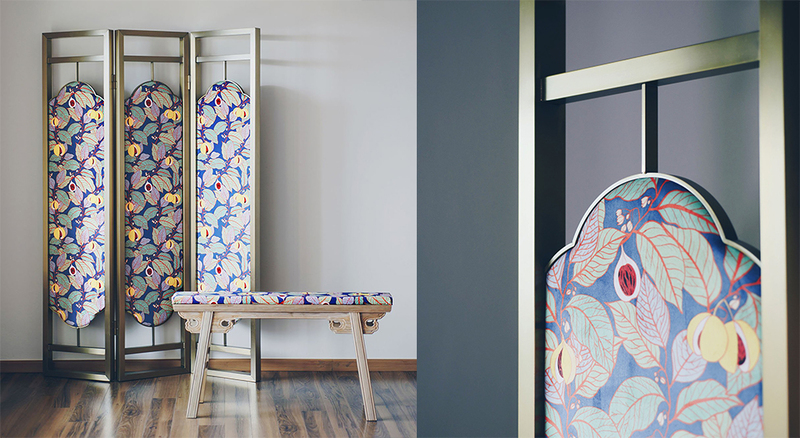 They even had their hand at designing furniture, working with modern oriental furniture brand SCENE SHANG to create statement pieces. Just two years after starting up, Binary Style found itself building up a reputation with larger names in Singapore. They now count Isetan and The Fullerton Shop as some of their major stockists. They were also chosen as one of the 61 brands to be featured at Design Orchard, a new mall opened by the Singapore Tourism Board that exclusively showcases local entrepreneurs. 2017 was noteworthy for Binary Style, as they scored Singapore Airlines as a client. They were commissioned to design a scarf for the airline’s 70th anniversary, which was available for passengers to buy on KrisShop. It was also the same year that the National Heritage Board asked the sisters to create an entire new collection for the Museum Label, focusing on Singapore’s historical artefacts. 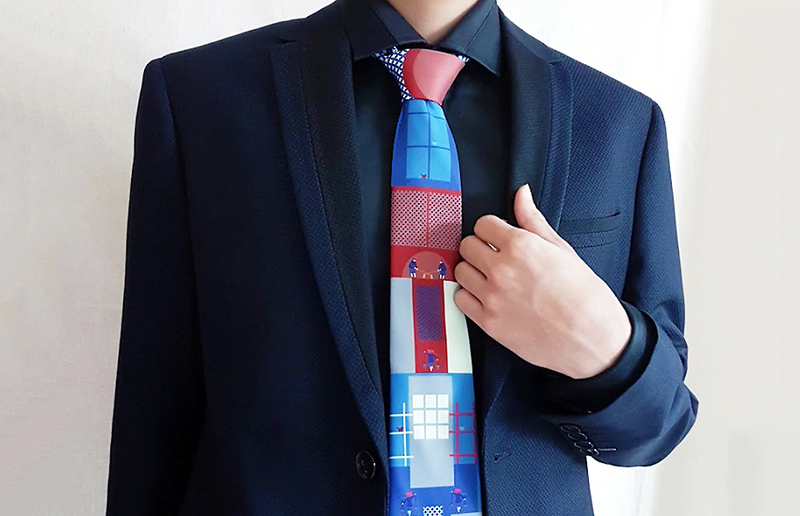 Following that, they worked with the Ministry of Trade and Industry to design neckties that were worn by liaison officers at the 2018 ASEAN Summit and its related events, in the year that Singapore held the ASEAN Chairmanship. Binary Style continues to play a part in mapping Singapore’s historical journey. Joining in the commemoration of our Bicentennial in 2019, which marks the 200th anniversary of Sir Stamford Raffles’ arrival, they’ve made new designs to reflect the occasion. 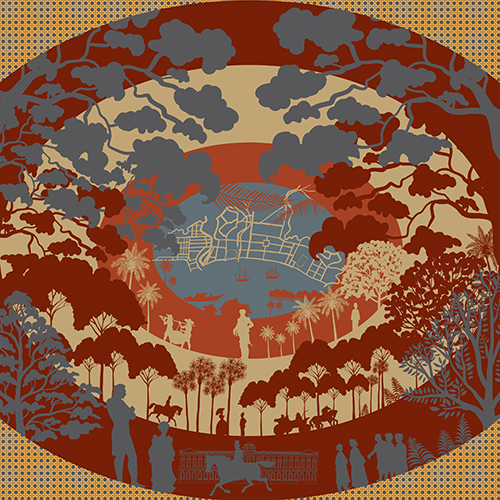 Santhi shares that the Bicentennial scarves feature “a vignette of Singapore before and around 1819”, with layers of imagery showing how the nation began to morph from a sleepy fishing village when the British arrived—and they’ll be released in April. Santhi and Sari’s finesse at weaving local stories into designs also took them beyond our shores. Not only did they explore patterns with the padi fields of Bali and wildlife of Borneo, and work on collaborations in London and Sydney—they also brought Singapore’s art and culture over to New York. Binary Style, along with six other Singaporean labels, was featured by Asia Society, a non-profit organisation promoting Asia in the United States. 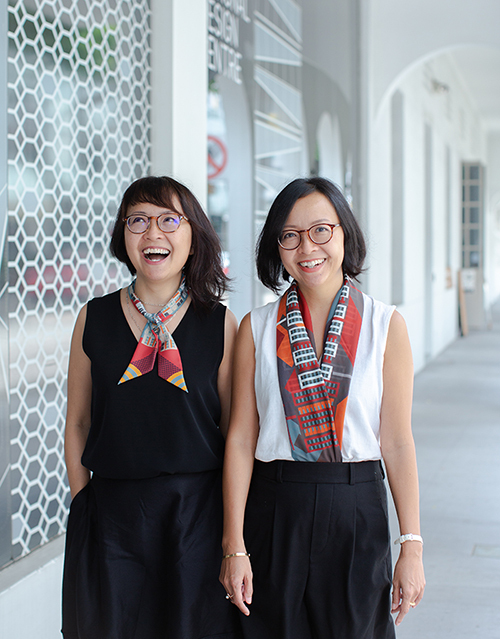 Their scarves were carried at Asia Society’s retail arm, AsiaStore, for a few months, where Santhi and Sari used their designs to take people through the history of Singapore. They explained in an interview with Harper’s Bazaar that they showcased their scarves with an intentional chronological order—the first depicted Sang Nila Utama encountering a lion, the next showcased samsui women as labourers in the 1920s, followed by the scarf featuring our oldest estate, Tiong Bahru. As someone who’s not originally from this country, there is a bit of a twist in our perspective of Singapore. We’d like to invite others to see Singapore through our eyes. After four years as business-owners, Santhi and Sari have grown more confident, but not without stepping out of their comfort zones, even in their close relationship as twins. “We thought we knew each other so well, being twin sisters. But we [ended up] rediscovering so much about each other and ourselves,” they say. 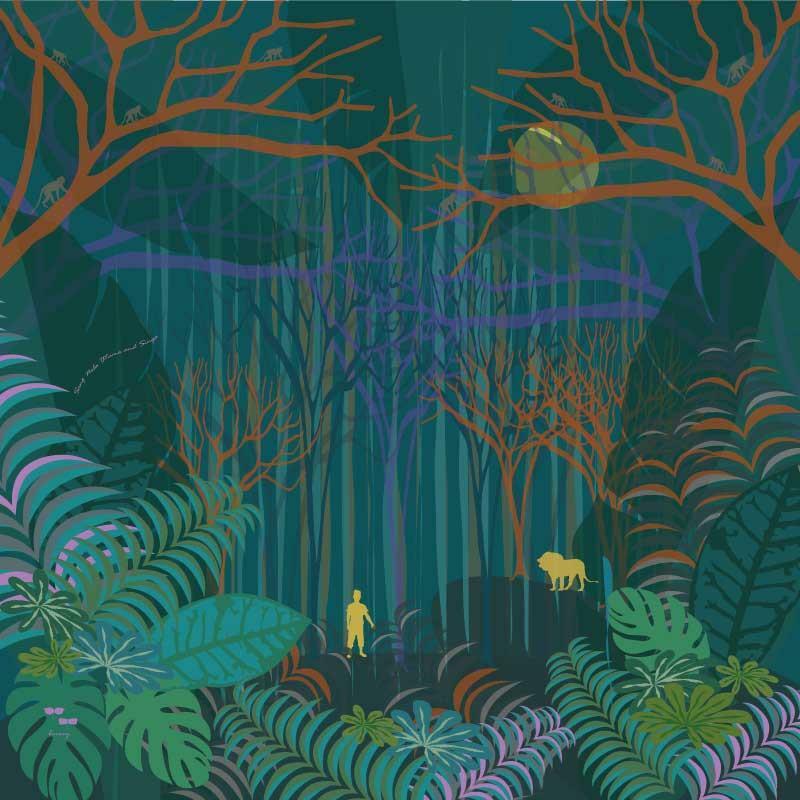 Stretching themselves from designing graphic art, to producing scarves, and expanding into other products, has pushed them into new challenges each time, and they intend to continue exploring outside their circle. To find out more about the binary twins behind Binary Style, click here, or follow them on Facebook and Instagram.